Huge Savings! 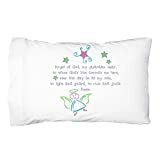 Up to 18% off on Sheets & Pillowcases at Rossetti Productions. Top brands include De Look, Creative Commodities, Ear Mitts: Earmitts; Bunnies and Bows, Message Brands, 3dRose, & Flipside Pillow. Hurry! Limited time offers. Offers valid only while supplies last. 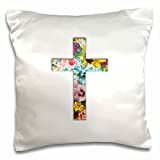 3D Rose Floral Christian Cross Colorful Girly Flower Pattern Religious Symbol Pillow Case, 16" x 16"